Vancouver, B.C… Corvus Gold Inc. (“Corvus” or the “Company”) - (TSX: KOR, OTCQX: CORVF) announces further drill results from the 2016 North Bullfrog exploration program (Figure 1). 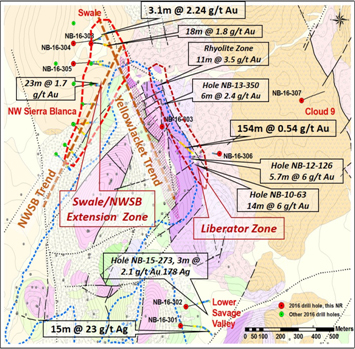 The extension of the YellowJacket structural zone was again intersected in hole NB-16-308 at the Swale target with 3.1m @ 2.24 g/t gold & 3.5 g/t silver within 9.15m @ 1.02 g/t gold & 1.93 silver, approximately 50 metres north of hole NB-16-300 (NR16-09, June 7, 2016, 18.3m @ 1.76 g/t gold). This zone of stockwork mineralization is surrounded by broad zones of low grade gold mineralization indicating the YellowJacket gold system remains strong and continuous in the northern most hole drilled to date (Table 1). Drilling has now extended the YellowJacket Zone an additional 250 metres to the north of the existing resource and additional assays for recently completed holes at the Swale target are pending. Initial drill results from the Black Vein target has now highlighted the importance of the re-emerging Liberator structural zone, a parallel structural zone just east of the YellowJacket deposit with potential to host high-grade mineralization. Significantly, drill hole NB-16-303 into the Black Vein target returned 153.92m @ 0.55 g/t gold & 0.92 g/t silver. Follow up drilling is being planned to test for significant tonnage of higher grade mineralization. Figure 1. Drill hole locations map for 2016 North Bullfrog project. The new results from holes NB-16-304, 305 and 308 at the Swale target have now focused our exploration on the potential in this area and confirmed the northern extension of the YellowJacket structural system. 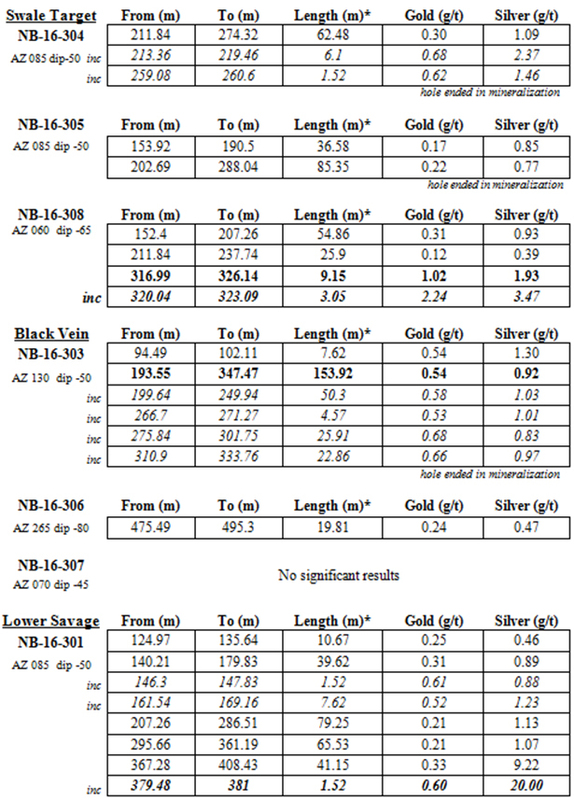 Hole NB-16-308 intersected 3.1 metres @ 2.2 g/t gold & 3.5 g/t silver within 9.15m @ 1.02 g/t gold & 1.93 silver which is the northern extension of the structural zone previously encountered in hole NB-16-300 (18.3m @ 1.76 g/t gold). Mineralization in hole NB-16-308 continues to trend NW and is hosted in a dacite unit as opposed to the more favorable rhyolite unit in hole NB-16-300. This new drilling has extended the YellowJacket system approximately 250 metres northwest of the current YellowJacket resource. In addition, the large rhyolite body intersected in holes NB-16-304 & 305 has retuned thick intervals of low-grade gold and silver and a number of zones with high levels of uranium and molybdenum. This highly altered and broadly mineralized rhyolite body has emerged as an important host rock for structurally controlled, YellowJacket type vein and stockwork zones. A number of the remaining exploration holes with pending assays in the Swale target area have intersected parallel broad structural zones to the southwest and south of the zones hit in holes 300 and 308. This area is about 500 metres by 200 metres at the north and west end of the current YellowJacket resource. With the earlier results from the NE trending NWSB zone in hole NB-16-298 (NR16-09, June 7, 2016, 23m @ 1.7 g/t gold) we are now projecting a major structural intersection of the two systems at the north end of the current pit design. This complexly faulted area forms an excellent mineralizing environment for multiple high-grade zones and will be a primary target of resource development drilling in the second phase of the 2016 program. Drill holes NB-16-303 was drilled to test the deep potential below earlier high-grade intersection returned from the Liberator structural zone in the Black Vein target area NB-10-63 (NR11-03, February 1, 2011) with 13.7m @ 5.9 g/t gold & 5.2 g/t silver and NB-12-126 (NR12-10, March 22, 2012) with 5.7m @ 6.6 g/t gold & 9.9 g/t silver). Results from hole 303 intersected a very broad zone of gold mineralization within the target (154m @ 0.54 g/t gold). This very thick zone of gold mineralization and the shallower high-grade intersections appears to be associated with the large Liberator fault system which lies just east of the YellowJacket deposit but dips in the opposite direction. The Liberator structural zone has not been effectively explored in the past and is now emerging as an important target area immediately east of the current pit design. It’s also possible that the previously discovered Rhyolite zone (10.7m @ 3.5 g/t gold) and the 350 zone (6m @ 2.4 g/t gold) are also related to the Liberator system which has a known strike length of over a kilometre. This emerging new YellowJacket type target will also be tested in the next phase of drilling. Scout drilling was completed to test the depth potential of the Liberator zone to the east and to test a wildcat vein target in the Cloud 9 area. Hole NB-16-306 was drilled about 100 metres east of the Black Vein target and intersected a broad low-grade interval of gold mineralization deep along the Liberator fault (~400m below surface). This mineralization indicates the Liberator gold system is extensive. Hole NB-16-307 tested the Cloud 9 target, a banded quartz vein outcropping along the West Jolly Jane fault about 800 metres east of Black Vein and about 2 kilometres north of the Jolly Jane deposit, although altered the hole failed to return any significant gold or silver values. Two holes were drilled to follow-up high-grade silver mineralization found at depth below a large new zone of low-grade mineralization east of the current pit design. These two holes drilled 100 metres north and south of the original discovery hole NB-15-273 (NR16-03, January 26, 2016, 3.1m @ 2.1 g/t gold & 178 g/t silver) and intersected thick zones of low-grade mineralization confirming the systems extension to the east. In hole 301 a thicker zone of silver mineralization (15.2m @ 0.4 g/t gold and 23 g/t silver) was intersected in the same horizon as the earlier intercept in hole 273. The hole to the north, NB-16-302 also hit this horizon but only returned low-grade silver (38m @ ~0.4 g/t silver). The mineralization appears to be related to a replacement style within a specific horizon in the volcanics package near the basement contact. Although intriguing, this deeper replacement style of mineralization will not be followed up in the next phase of drilling. For additional information on the North Bullfrog project, including information relating to exploration, data verification and the mineral resource estimates, see “Technical Report and Preliminary Economic Assessment for Combined Mill and Heap Leach Processing at the North Bullfrog Project, Bullfrog Mining District, NYE County, Nevada” dated June 16, 2015 as amended and restated on May 18, 2016, which is available under Corvus Gold’s SEDAR profile at www.sedar.com.